Originally published in the WHO Goodwill Ambassador’s Newsletter for the Elimination of Leprosy, Issue No. 76 (October 2015). The information was correct and current at the time of publication. Raised in different countries and cultures, two siblings finally come face to face. 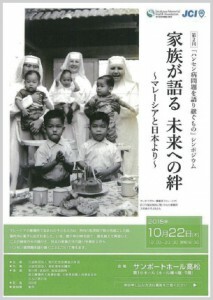 Nurul (left) pictured with younger sister Esther in Japan on October 24. Audiences in Japan were privileged in October to hear the stories of two sisters who met for the first time earlier in the month and who learned of each other’s existence only recently. Esther Harvey of New Zealand and Nurul Ain Yap binti Abdullah of Malaysia were born to ethnic Chinese parents in a leprosy settlement on Pulau Jerejak, an island off Penang, Malaysia. Their parents were not allowed to keep them, and both girls were eventually adopted — Esther by New Zealand missionaries and Nurul by a Malaysian couple. Esther’s adoptive parents told her when she was 16 that her birth parents had contracted leprosy. Nurul was given differing accounts of her origins, among them the story that she was the child of leprosy patients. The girls grew up, married and raised families, each unaware she had a sibling. In 2006, Esther felt ready to trace her roots. Her search led ultimately to Nurul. But before that, she would discover that her biological parents were already dead. “Words can’t describe the sense of disappointment when I received that news. I really felt quite devastated,” she said. In the course of her research, however, she learned that her father had a younger brother and sister. She was eventually able to make contact with her aunt, who told Esther she had a sister. She was stunned. Sometime later she was introduced to Eannee Tan, who has made it her mission to reconnect families separated by leprosy. It was Eannee and her team at Care & Share Circle who tracked down a birth certificate for Nurul on March 25 this year and an address for her in Kuala Lumpur on April 9. Elated, they went to Nurul’s home in Kuala Lumpur that night. En route, they sent Esther a message via Facebook that they were going to meet her sister. Several hours later, Esther received a photo of Nurul. “I just stared and stared at the photo for such a long time. I could hardly believe it,” she said. If Esther was startled at the speed of developments, imagine Nurul’s reaction when three strangers arrived at her door, telling her she had a sister and confirming the story her parents were from a leprosy settlement. “I was really shocked and confused. All the while I thought that I was alone, so when Eanee told me about my sister, I was not sure that Esther truly existed and that she was looking for me. In fact, I did not know how to react,” she said. But after learning that Esther had spent the past nine years searching for her family, Nurul felt it would not be fair to reject her. She also decided to visit the Sungai Buloh leprosy settlement outside Kuala Lumpur where her parents had moved after Pulau Jerejak. In doing so, she was following in the footsteps of her sister, who had met people who knew her parents and dedicated a plaque at the Buddhist temple there. Esther and Nuru took part in a series of four symposia organized by Sasakawa Memorial Health Foundation promoting understanding of leprosy issues. It pains Esther and Nurul greatly that they never met their mother and father and were unable to do anything for them in their old age. “Getting to see with my own eyes how my parents had spent the rest of their days with no children to care for them, and being confined in the settlement all by themselves to their dying day, is very sad,” said Nurul.